World becomes more meaningful when we read the right type of books. The choice makes the big difference as you will be impacted by what you read. DJJS provides the supreme choice to read the real wisdom, which not only stirs the positivity but also possesses the power to change your perspectives towards life. Reading and gaining knowledge about the world, is limited to the application part to the world while reading spiritual books is the gateway to the inner world and introduces you to your real purpose in life which is knowing the Self. In order to awaken the visitors to the true knowledge, Divya Jyoti Jagrati Sansthan (DJJS), a non-government, non-profit and a leading socio-spiritual organization, whose Founder and Head is His Holiness Ashutosh Maharaj Ji, organized a stall for spiritual literature at World Book Fair, Pragati Maidan, New Delhi from 7th- 15th January 2017. The 9 days fair provided a great opportunity to volunteers for introducing visitors to the actual mission and vision of DJJS. Visitors were astonished to know about some of the experiences of volunteers and appreciated their self-less service. Many books attracted the attention of visitors with their invaluable contents. “Ashutosh Maharaj – Mahayogi Ka Maharahasya” was the main attraction and the most-selling book. This book authored by Sandeep Dev characterizes the life incidents of revered Gurudev and shares his journey on the Spiritual Path and the origin of DJJS and the aftermath. 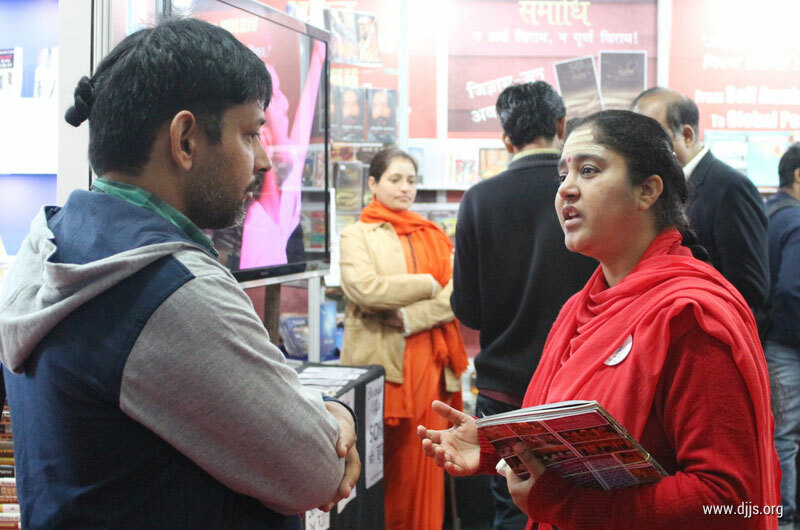 Other books and Sansthan’s spiritual literature like Akhand Gyan- Monthly Magazine, Gems of Spirituality, Mind-Double Edged Sword, Divya Sandesh, Search of Truth, Insightful Chats Online, etc., also attracted the attention of the visitors and kindled their curiosity to know more about the pursuit of Truth. The recurring spiritual conversations of volunteers with visitors awakened them to know more about realision of their real-Self. Visitors realized that in the world of paradoxes where we are living in, money and technology have limitations and cannot change the mind-set of people. Now, we need the ultimate source of knowledge, energy and positivity which can lead us to the mental peace. The World Book fair successfully served the purpose of flowing the river of knowledge into the hearts of visitors.